Just a few more makeovers from the Media Room to share. 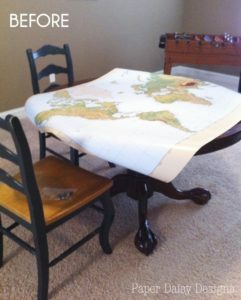 Today, it’s the Map Game Table. Because it’s always fun to see where you came from. 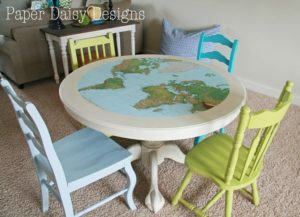 Here’s the ugly table with the map thrown across it. What my very cool map is hiding underneath it though, is the bowing and swollen spots in the center of the table. 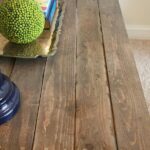 Believe it or not, this table top was actually particle board. I wish I had photos of the damage, because fixing it was interesting. I ended up sanding the swollen particle board down. It kind of just shredded like cardboard. Once it got it even, I patched it with dry wall spackle. All I wanted was a smooth surface since the top was going to be covered by the map. It also had a bead trim around edge that was missing in some spots. So that had to come off. I know I took photos of all this but, after looking for quite a while they are not to be found on my computer. GRrr. 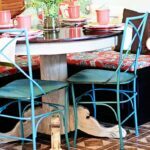 I gave the table a couple coats of Annie Sloan Chalk Paint in Old White. I really do love that paint. I know people are into DIY’ing the paint and I did that myself on a few of the chairs. More to come on that later. 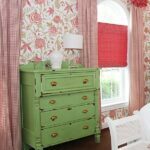 But I do think Annie’s paint is worth it, if it comes in a color you want for your project. 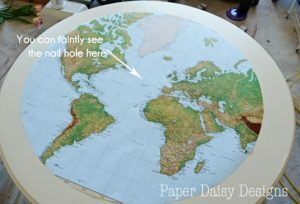 Then it was onto cutting the map into a very large circle. Initially I tried using a pencil and a string to draw a circle. That so did NOT work. The pin I was using for the center kept moving and the tension of the string was inconsistent. Not to mention, the angle of the pencil made a difference too. I kept ending up with a wonky circle. Not what I wanted. I needed a fixed compass. I got a scrap piece of wood and drilled a very small hole in one end for a nail. This is your constant point. Then I drilled another hole for the pencil at the distance of the radius of the circle. 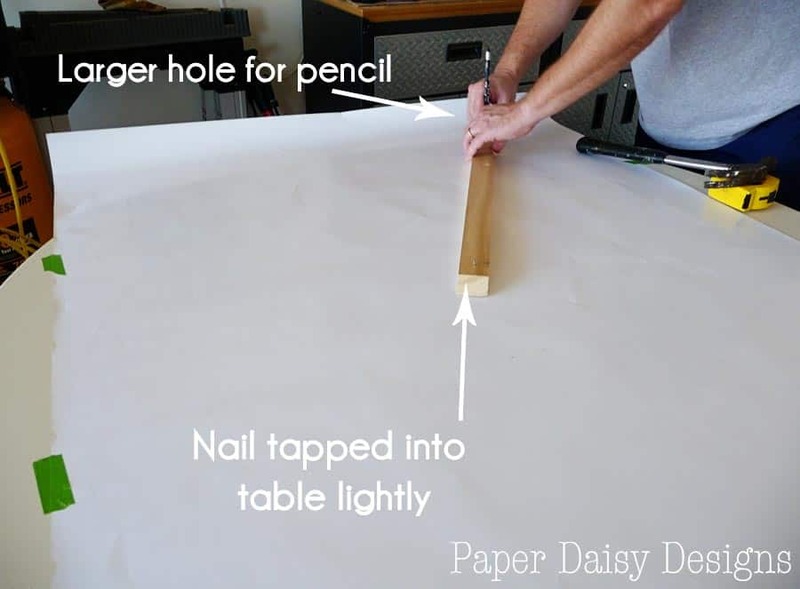 Now just rotate the pencil around the map, or whatever you desire to cut, until you meet the point where you started. Then I carefully cut along the pencil line with sharp scissors. I felt pretty comfortable with this because of my years of experience in paper crafting. The best tips I can give you is to not “saw” your scissors and move the paper not the scissors. You’ll be surprised how much these two tips help you cut a smooth edge. I can generally cut a circle better with scissors than with an Exacto type blade. I carefully smoothed out the whole made by the nail and color matched a bit of acrylic paint to cover up any remaining traces. 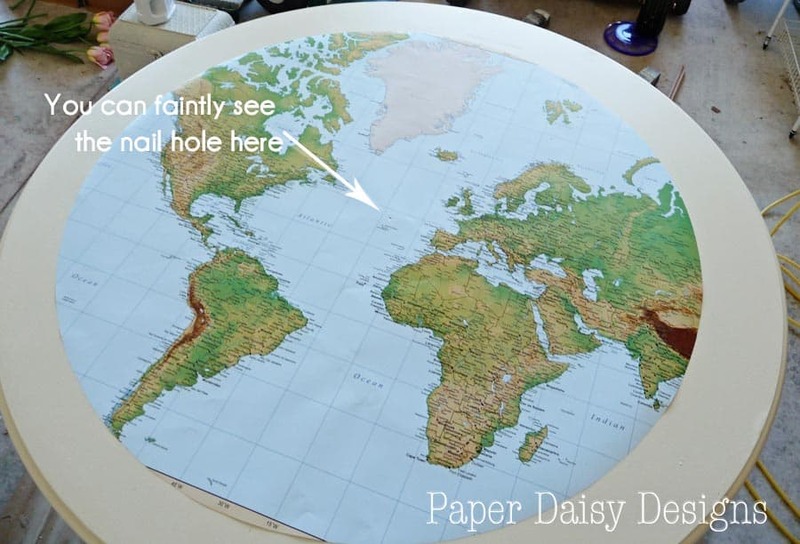 I used Mod Podge Hard Coat to apply the map to the painted table. I quickly coated the back of the map, flipped it over used a bone folder to smooth it out. Later I came back and put two more coats on top. 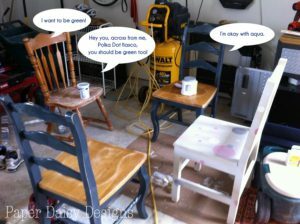 I chose the Hard Coat version because you can sand after coats and it is the most durable for furniture. I didn’t need to sand it any, it was pretty smooth finish. I had intended to apply a coat of wax on top like I did to the table itself, but I’ve yet to do it and it’s holding up fine. Here’s the final table and chairs. The two other chairs were finds Emily and I hunted for at our local thrift stores. The chairs got a different colors. 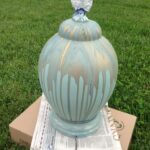 Once the colors were decided, I lightly sanded all of them and whipped the ones that weren’t getting the real deal Chalk Paint with Liquid Sandpaper. The blues were mixes of Louis Blue and a deep turquoise I had. 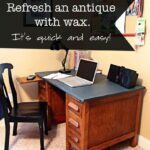 Yes, you can mix Chalk Paint with other latex paints. I haven’t had any problems. The recipe I use is 3 parts paint, to 1 part Plaster of Paris, just enough hot water to mix the Plaster of Paris into a paste and then mix it into the paint. Here’s another look at the table from one side of the room. Please feel free to visit the Media Room Tour and check the rest of the room out! Thanks for visiting! I’d love to have you follow me on Facebook or Google +. This turned out great. The map table is so fun and the chairs are so fun. 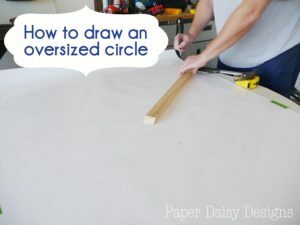 I&#39;ve always wondered how to cut a oversized circle. I&#39;m not a skilled paper crafter, so not sure I could cut a perfect circle. Your tips are fantastic, though. Thanks for sharing. I love your map table. Very cute and unique :. 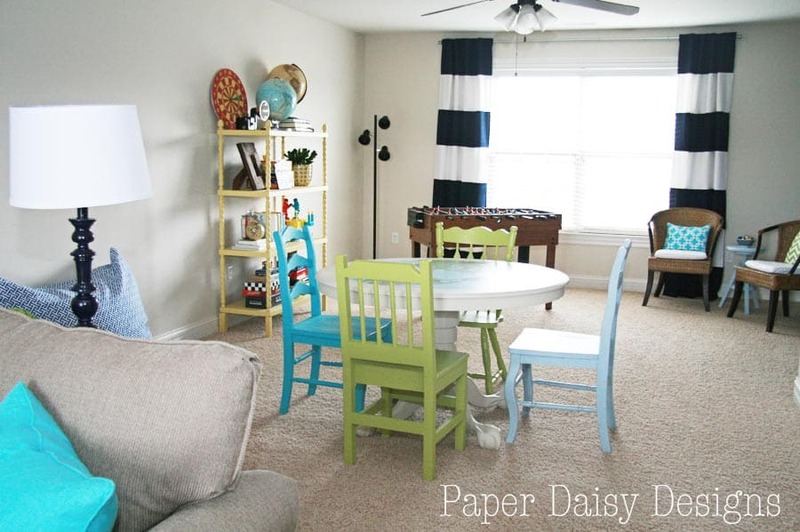 The colors of the chairs are perfect. 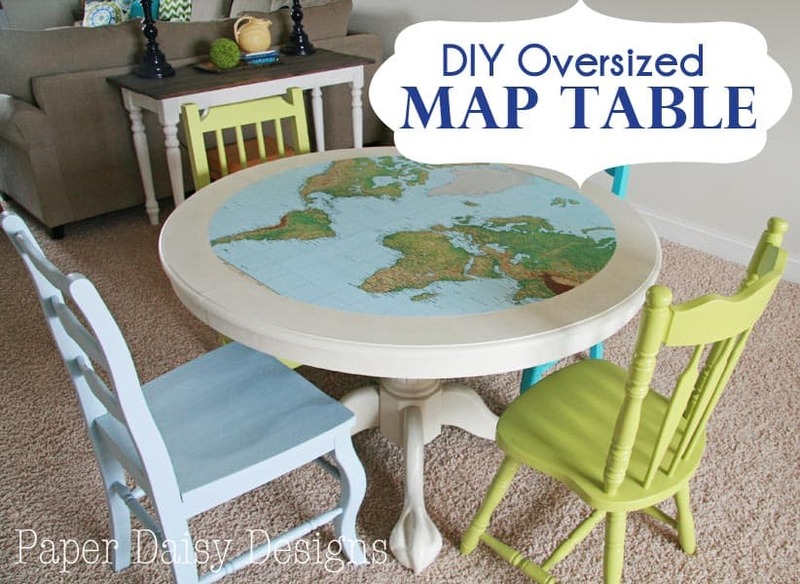 I love your map table. It is so cute and unique. The chairs are perfect. Love the colors and the mix and match look. What a charming table~ love it!! Sharing at the party tomorrow~ thanks for linking up at Feathered Nest Friday! Love this idea Leslie. Thank you for sharing this project on Shabbilicious Friday. I will be featuring this at tomorrow&#39;s party, so please pop over and pick up a Featured button.